Rain forests have been ravaged in recent years, as never ending streams of pulp are pumped out by publishers on the phenomenon that is Celtic. Turgid player autobiographies compete for bookshelf space with second rate football hacks, whose hurried and badly written volumes are churned with an eye on the Christmas shopping markets rather than literary biblioteques. If in doubt, type ‘Celtic Football Club’ into Amazon.com and check what appears. Every so often though, a diamond emerges from the rough – and more often than not it comes as a passionate labour of love from one of our own homespun historians. 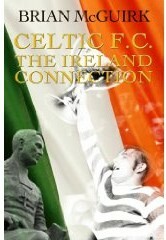 Celtic FC – the Ireland Connection is one such publication that has recently taken aim at the bestsellers list. The self explanatory title leaves no illusions and the Dundalk based author Brian McGuirk firmly inserts the football club into the pantheon of Irish history. A natural starting point for any historical narrative is the Hunger of the 1840’s – which spun a whirlwind of Diaspora from Erin to Easter Island – but a toe-dip history going back hundreds of years before is also offered to build rich context on the history of the Irish Empire.An Gorta Mor provides the historical fulcrum, where the club’s acknowledged founder, Andrew Kerins, later Brother Walfrid, began his life in Ballymote in Sligo, before his vocation carried him to Scotland’s Green Hill. It gives a forensic examination of the DNA of the Irish in Scotland, right down to families occupying Lanarkshire villages, tracing lineage right back to towns in Ireland eight or nine generations away. All of this stunning information is presented in an interesting way, weaving historical fact with football, lore and song.And politics plays a role. Thank god that Fenian activist Pat Walsh was aided in his flight from Ireland in 1867 by a sympathetic British soldier, who allowed him to escape on a boat to Scotland. Indeed, the same ‘Tommy’ was startled in 1887 when Walsh, now a master tailor and successful businessman, knocked on his door with Brother Walfrid and builder John Glass, close friend of Mayo radical Michael Davitt, the club’s first patron. We can only assume the soldier, Tom Maley, was relieved when the men revealed they were recruiting his sons for a new football team, rather than a revolutionary organisation, as Maley had feared. All these yarns are well preserved and the most prominent soldiers’ son, Willie, receives his own chapter, such is his pivotal role in the Celtic story.And, most appropriately, the sister club Belfast Celtic receives the same treatment. With an excellent potted history of its roots, the 9 shilling donation provided by the Glasgow cousins and the club’s disgraceful treatment of the at the hands of football’s authorities on more than the one infamous occasion (leading to the team’s withdrawal from football forever). This chapter is a tidy introduction to those whose knowledge is hazy.Clear and close links are highlighted and in the section on Irish Celtic players. Several (including Pat Farrell, John Blair, James Foley, the magnificent Mickey Hamill and the mercurial Charlie Tully) proudly carried the jersey of both clubs. The role of the Belfast Celtic Society is also acknowledged and www.belfastceltic.org is marked for historical data, proving the importance the site holds as a repository.There are a few minor errors. Belfast Celtic’s historian is Bill McKavanagh (not Cavanagh) and a few other Irish players (including North Belfast’s Gerard Lyttle, who signed in 1995) are omitted from the excellent list of players, past and current. Presumably, publication came just too early for Derry’s Niall McGinn.As well as this, the town of Athenry is the ‘Fort’ of the King (not ford, as suggested) and it’s disappointing to note that in a chapter on our music, no mention is made of the most famous of all Celtic songs, that immortalized by Glen Daly, first sung on the Donegall Road in Belfast before being carried to Glasgow by supporters. McGuirk contends that the origins of Celtic FC as a business are ‘unclear’, but other historians have offered blow by blow accounts of the corporate shenanigans of 1896-98. Lastly, one hugely significant item is missed completely - the Co. Antrim connection central to Fergus McCann’s maneuverings to wrestle boardroom control in the mid-90’s. The old lady of Toome, used by Robert Kelly to fasten his grip on the club, is the stuff of Celtic legend.Refreshingly, there is little in the way of references to the other half of Glasgow and the history of the club’s connection with Eireann stands on its own and not in relation to anything else that may have impinged on our history along the way. Other excellent additions are included, like a facts chapter to keep trivia buffs well stocked, an account of the Tricolour crisis in the 50’s and a foreword from the venerable Michael Kelly, tireless secretary of the Association of Irish Celtic Supporters Clubs. McGuirk is also generous in his thanks to those who helped with the book, which is well worth the cover price and an excellent addition to any hooped bookshelf.